Q - We occasionally run into an issue with our terminal server where Elliott crashes after entering the username/password. After clicking on the shortcut, it prompts for the username / password. After clicking OK, it crashes. We are confused because there are users already using Elliott 8 on the TS, but new users cannot log in. From my past experience, if I reboot the terminal server (not the Elliott PSQL server), this error will be corrected. I have verified that MSVCRT20.dll is in the Elliott7/Bin folder. We have added all of the Elliott 8 executables to the DEP safe list already, but you cannot add .DLL files. Since all other users not on the terminal server do not have this issue, we know that it must have something to do with the terminal server and some Elliott files, but we do not know what. As a matter of fact, the users who are currently running on the terminal server can continue to work in Elliott. It is just the new users logging on to the terminal server that have this issue. What can we do to diagnose the problem? A - This is a known issue with Microsoft Terminal Server. The nature of the issue is related to how the Microsoft Terminal Server handles open DLL files from a network shared folder. The FCB (File Control Block) belongs to the user instead of the system. When the user who owns the FCB logs out from the server in certain conditions, the FCB can be orphaned. 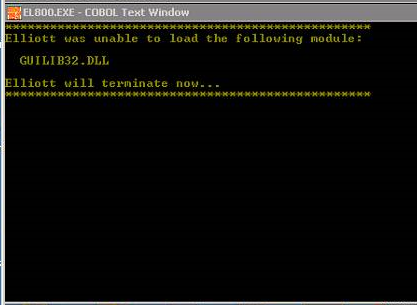 As a result, other users may get errors when try to access the DLL file. How to Confirm If This Is Indeed The Cause? (1) If you can get all other users on the terminal servers to close Elliott and logout their Windows session. Then, as the sole user on the terminal server, try the same Elliott application again. If the Elliott problem goes away, then we know for sure this is the cause. (2) If you can't get all other Elliott users to logout for some reasons, then you can reboot the terminal server. After the reboot, if Elliott start to work correctly on the terminal server, then it is likely this is the cause, but we can't be sure 100%. Error 173 simply means the particular file is not found. In this case, Elliott is trying to load the bar code DLL to render the barcode image. 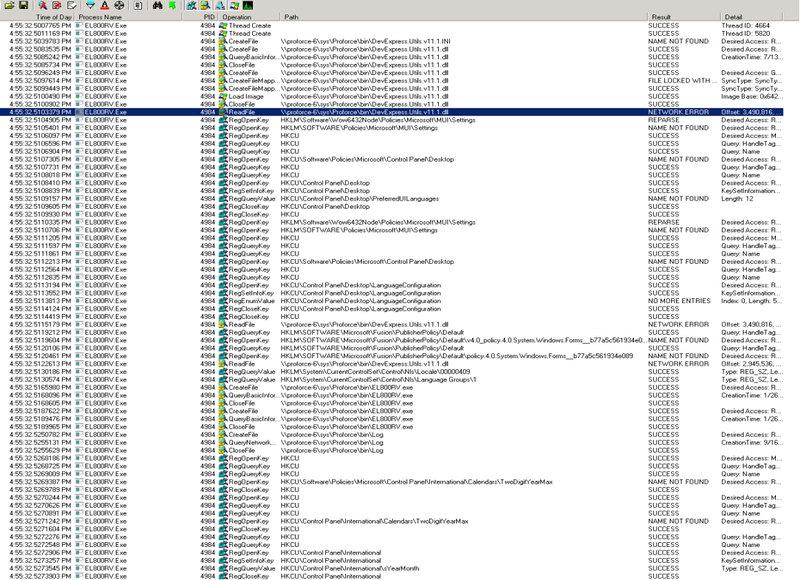 The DLL is in the Elliott root or bin folder. Elliott is not able to find this file due to bogus NETWORK ERROR as outlined in previous discussion. 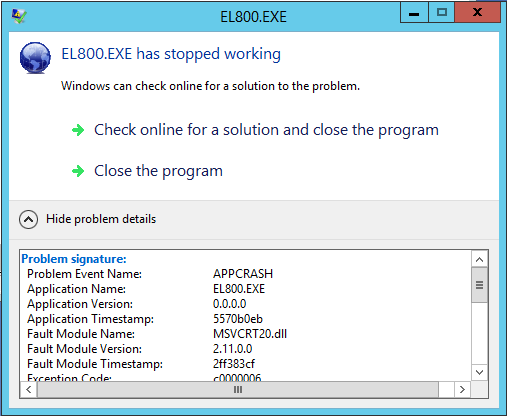 With this particular problem, you can display the report in notepad which you will by pass the error temporarily. There are many faces to this same problem. In all these cases, at its root, Elliott has problem loading a DLL file from the Elliott mapped network drive which is caused by Microsoft Operating system bug as mentioned in the previous article. Ask all users on this Terminal Server to exit Elliott. Once all users are out of Elliott, then ask users to come back into Elliott again. If some terminal server users can not be contacted.. Especially, they are disconnected, you can log them out by bringing up the task manager on the server console. In the User tab, highlight the disconnected users and choose to "Logoff". See sample screen below. General speaking, the above two steps should solve the problem. If not, reboot the Terminal Server. In one incident, the user has a terminal server for overseas users to access Elliott. We noticed many of their overseas users do not logout of Elliott when done. This is understandable because it takes time for these users to logon to the Terminal Server, then it takes time for their Elliott session to start up. These users felt that if they kept their sessions open by just disconnect (by clicking on the "x" of their terminal server sessions,) then when they reconnect again, they can skip all the startup process and get to work in Elliott quickly. Unfortunately, this practice is not desirable if you are ecountering this problem described in this article. Therefore, we asked their US office to monitor the terminal server overseas users at the time when they are not supposed to be in the system. Then report those users to the president of the company. After the president of the company had a conversation with those users who didn't logout of Elliott when done, this problem totally went away. It is important that Elliott users should logout at night time for many reasons. This is just one of the reason. You could, for example, implement a procedure to ask the first person that arrive the company to start up Elliott as the first thing in the morning, then go to Main Menu -> System Utilities -> User List. Then a list of users will be displayed and show the last login time. For those users does not logout at night, email them to remind that they need to logout of Elliott at night time. Keep on doing this until they adopt this practice. If they ignore, then take this issue to the higher authority in your company. It is bad idea to forcefully terminate the Elliott users just because their connection is dropped temporarily. Our theory is that the forceful termination of Elliott sessions may leave certain Elliott DLL files in the orphan state as indicated in the Microsoft Knowledge Base. 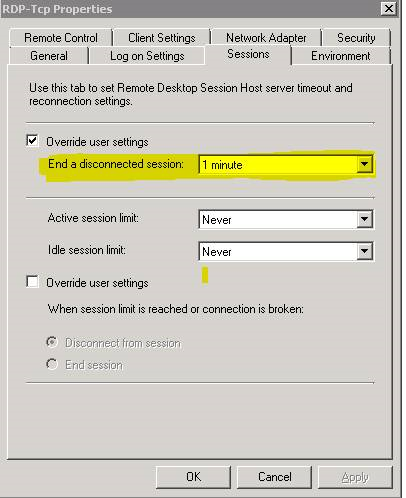 We suggest changing the above setting to "Never" so the terminal server will never end a user session automatically after a session is disconnected. 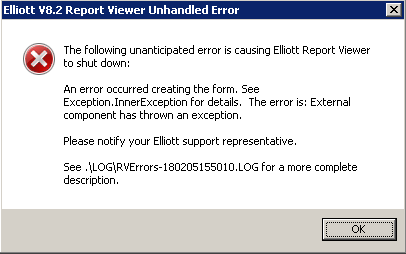 As a system manager, if you wish to terminate the disconnected Elliott user session, you should take over the user session and log the user out of Elliott and then logout the user session gracefully.